We have discussed our new addons of Order Delivery Date Pro for WooCommerce plugin in previous posts which were Pickup Date Addon, Local Pickup Plus Compatibility Addon and WooCommerce Subscriptions Compatibility Addon. We will now focus on the integral part of this plugin called ‘Custom Delivery Settings’ which provides powerful features & out of those today we shall look at how to setup delivery date & time settings for different shipping methods. The settings for different shipping methods have to be configured under Order Delivery Date -> Custom Delivery Settings tab in admin. 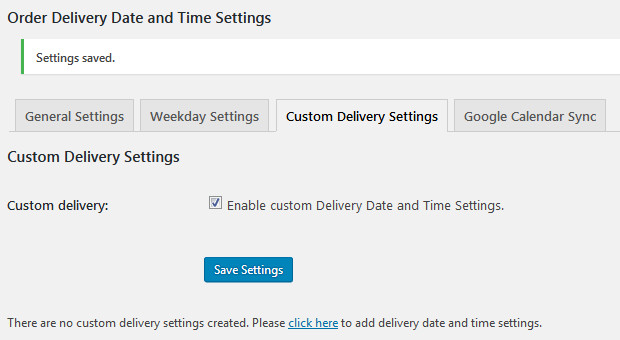 We need to first select ‘Enable Custom Delivery Date and Time Settings’ checkbox. This helps to identify if the delivery date & time settings for different shipping methods is enabled or not. Once you select Settings based on Shipping methods, enter the settings on the same page. 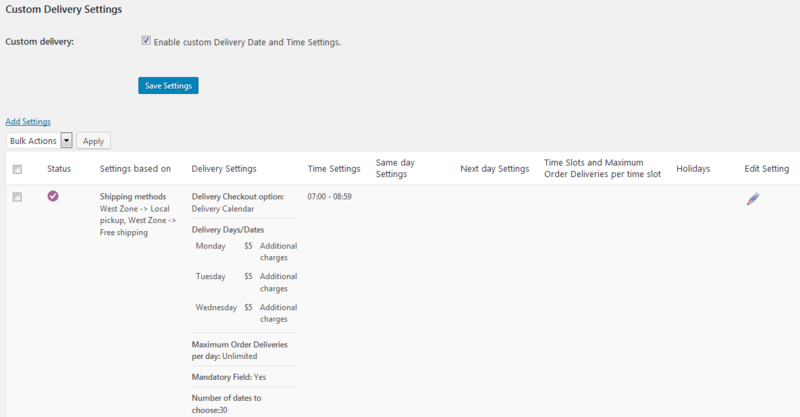 Step 4: Setup delivery date & time settings for shipping methods. Select the shipping method for which settings needs to be made from the Shipping methods drop down. You can select multiple shipping methods from the drop down. Select the settings for the above shipping methods from an individual section and click on Save Settings button on the Add page. You can add settings for shipping methods of different zones. For instance, If we have West zone and East zone added and want to enable delivery on Tuesday for West zone and Thursday for East zone, then this can be done on Custom Delivery Date and Time Settings page under Shipping methods. You can click on the edit icon under the Edit Setting column in the table of the settings displayed on the tab. It will redirect you to the page to edit the settings with the populated settings added for the shipping methods. If the settings for a shipping method are not added under the selected shipping method, then the default settings added under the individual settings tabs will be enabled on the checkout page. If the Shipping methods option is disabled, it will not allow you to add the settings. So, in order to enable delivery based on the shipping methods, first enable the Shipping methods radio button. If the Enable Delivery Date checkbox is disabled for a shipping method under Custom Delivery Settings tab, then the Delivery date selection is disabled on the checkout page even if the Enabled Delivery Date on the Date Settings tab is enabled. Using this option, you can hide the field for certain shipping methods, for example Local Pickup. This post reveals the facts about easily setting date and time settings for different shipping methods feature. We have a series of such features out of which this marks the first and most important of all. Others to follow are setting date and time settings for different Shipping Classes, Product Categories and custom delivery settings with Other Plugins. We shall discuss about them in our upcoming posts soon. So why wait!! Grab this plugin now! !